WEST HARTFORD – Bonnie Bassette can often be seen at the membership desk at the Mandell JCC in West Hartford, warmly greeting members and addressing them by their first names as if she has known them forever. If not at the front desk Bassette is in the aquatics center, teaching young kids to swim or leading a Cardio Splash class with a sunny smile and offering encouraging words of instruction. “She is complete positivity and enthusiasm,” says JCC Executive Director David Jacobs. In December, Bassette used her people skills at the membership desk of the Jewish Community Center of Greater Pittsburgh as part of JResponse, a crisis relief program conceived by the JCC Association of North America (JCCA). Originally created to aid JCCs and Jewish communities during natural disasters like the hurricane in Houston, JResponse went into action after 11 congregants were massacred at the Tree of Life Synagogue in Pittsburgh’s Squirrel Hill section on the Shabbat morning of Oct. 27. After the shooting, the JCC of Pittsburgh became a victim’s assistance center where families of the slain came to meet with law enforcement to get information about their loved ones and to seek solace. Members of the wider Jewish community, reeling from the tragedy in their own backyard, also gathered at the JCC seeking support. 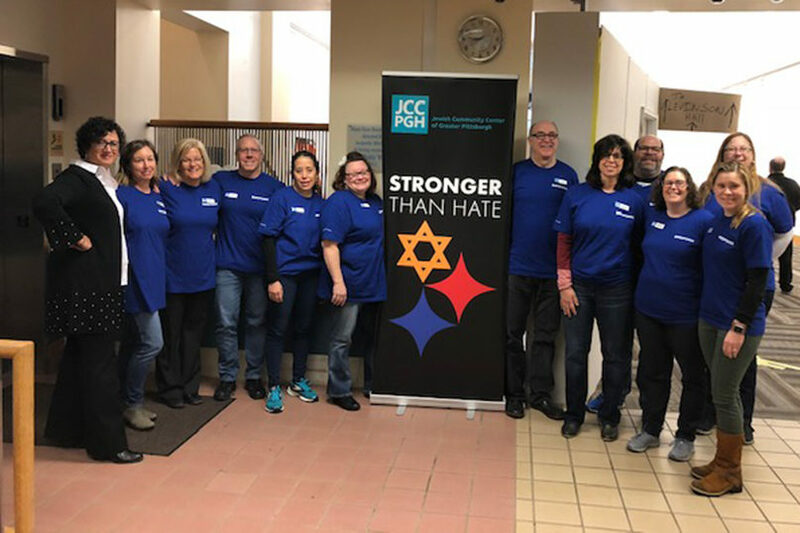 During those early days after the shooting, Pittsburgh JCC staff worked tirelessly to help the entire community deal with the trauma of the Tree of Life tragedy, while they continued to handle their usual heavy workload. Then, beginning in November, small teams of JResponders began heading to Pittsburgh to give these JCC staffers some respite. JResponders like Bassette pitched in to help in order to allow their Pittsburgh counterparts a day off, time to run errands, or simply a moment to heal from what has been an emotional few months. When Jacobs explained the program to Bassette, she instantly said yes and was signed up to be a JResponder that evening. Bassette arrived in Pittsburgh on the evening of Sunday, Dec. 16 and met her fellow JResponders – all of whom had already been texting back and forth getting to know each other – for breakfast in the hotel the next morning at 6 a.m.
“We were all just agreeing that it was so nice to be able to come and to participate,” she recalled. The group went to the JCC at 7:50 a.m. for training, led by the JCC’s assistant executive director Alexis Winsten. “She was able to share with us exactly what the community was going through after what had happened,” Bassette said. Originally, on the day of the shooting the FBI had allocated another facility for family members to congregate. But the families wanted to meet at the JCC and ended up waiting for news in the room where JResponse met for training. On Dec. 17, after training, a tour and going through a security protocol, Bassette’s group of JResponders began their work. Bassette began at the membership desk answering phones and helping members. After working at the front desk, Bassette escorted young JCC preschoolers to swim classes and gave them lessons in the pool. “I said, ‘I’m Miss Bonnie and we are all having a great time in the pool today,” she laughed. She later helped serve hot lunch to the JCC’s seniors. “It was so nice to connect with them,” she says. Each of the 10 volunteers had been given royal blue t-shirts with JResponse on it. David Jacobs has his own connection to Pittsburgh – he grew up in the city’s suburbs and took swimming lessons and attended summer camp at the Pittsburgh JCC as a kid, and after college he worked there as a professional. “I have a very special love for Pittsburgh,” Jacobs said. For Bassette, that was yet another reason she was happy to serve in Pittsburgh. Bassette is honored to have been the Mandell JCC’s JResponse representative. Besides his pride in Bassette and her contribution to the Pittsburgh Jewish community, Jacobs also praised JCCs in general for their dedication to their communities. CAP: The Mandell JCC’s Bonnie Bassette (3rd from left) joined with other JResponse team members to assist at the JCC of Greater Pittsburgh in the aftermath of the Tree of Life Synagogue massacre. Ahavat Israel a Bar Mitzvah in Beijing: Life really starts after 40!